Saying YES may be easier, but there's much more power in saying NO. Prioritizing - Time is valuable, so how you spend it is crucial toward reaching your definition of success. Saying NO puts what is important to you on a list. 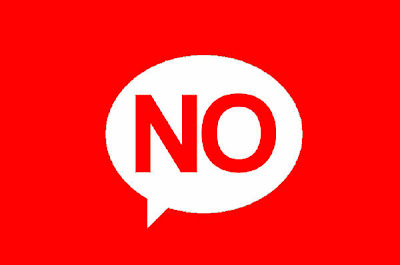 When you say NO it means you are saying YES to something more valuable. Saying NO helps you spend your time wisely. Boundaries - Imagine a game of tug of war, but you're on both sides of the rope. When you always say YES (even to things you don't want to do), your life is pulled around by others. It's like being in the passenger seat of a car and not having any say on where you're going. Draw a line between the things you want (YES) and don't want (NO). Determine what's inside and outside of your boundaries to help communicate and clarify your core values and desires. Respect vs. Like - Most people don't like to say NO because it lets others down. Instead of being known as a YES-man (or woman), wouldn't you rather be respected because of your honesty to say NO? When you say YES to everyone, you become a hostage in your own skin. You become unhappy with all your obligations, yet have no one to blame except yourself. Saying NO means you understand you can't please everyone. Choose NO and uphold your values. People who say NO are respected. Life isn't a popularity contest. Make decisions for yourself, not others. Practice saying NO now so when more important decisions come along you'll feel empowered to make the right choice. oh man. this is a good reminder for "people-pleasers" like myself. you make a good point; i'd much rather be respected for being real, than oblige to things i don't completely want to do in hopes that i'd be liked. besides, being real is a lot less work than having to pretend like you enjoy something that you don't. Thanks Torrie! Glad you liked it. Yeah it can be a tough pill to swallow if it's not your initial tendency, but in the end it's worth working towards. Can You Fix Your Weaknesses?